Saw the tweet. Retweeted. 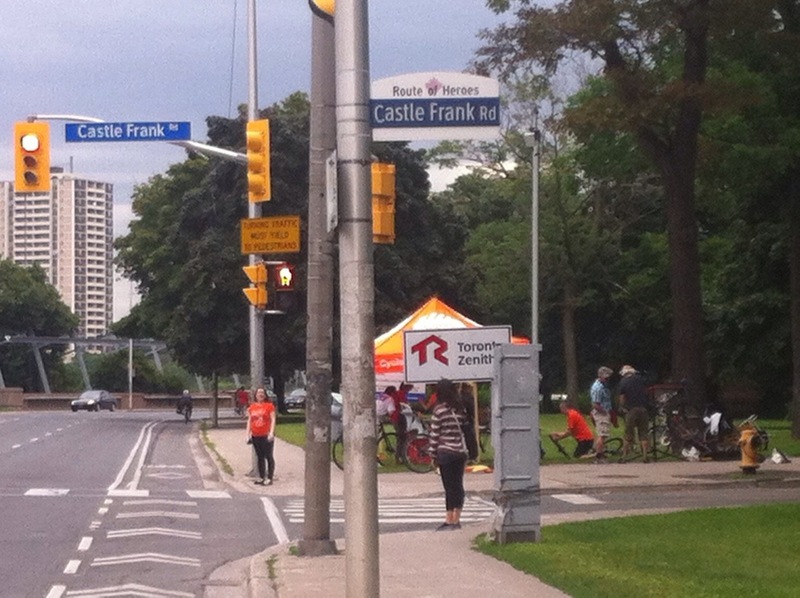 And bolted right over to the parkette at Bloor and Castle Frank, along with a stream of cyclists eastbound flocking to the tune up tent. CycleTO has been hosting Tune-Up Tuesdays all spring and summer. Today’s 3-hour event (5-8pm) had two bike technicians courtesy of Sweet Pete’s. You get a free basic tune up, which includes air, oil and safety check, as well as the chance to chat with the volunteers about what matters to cycling life in the city. “We had great turn out at Poplar Plains last time with Bateman’s partnering with us,” says Rachel, one of the volunteers. The volunteer team on hand were welcoming and informative about CycleTO’s many engaging campaigns, including #minimumgrid. “Oh but you should check out one of our Bike Valet stations in an upcoming event,” beams Kyla. “It’s always an awesome turn out! You sign in your bikes, we hand you a ticket and off you go. ” Next one I think is at Echo Beach for Molson Ampitheatre gigs. 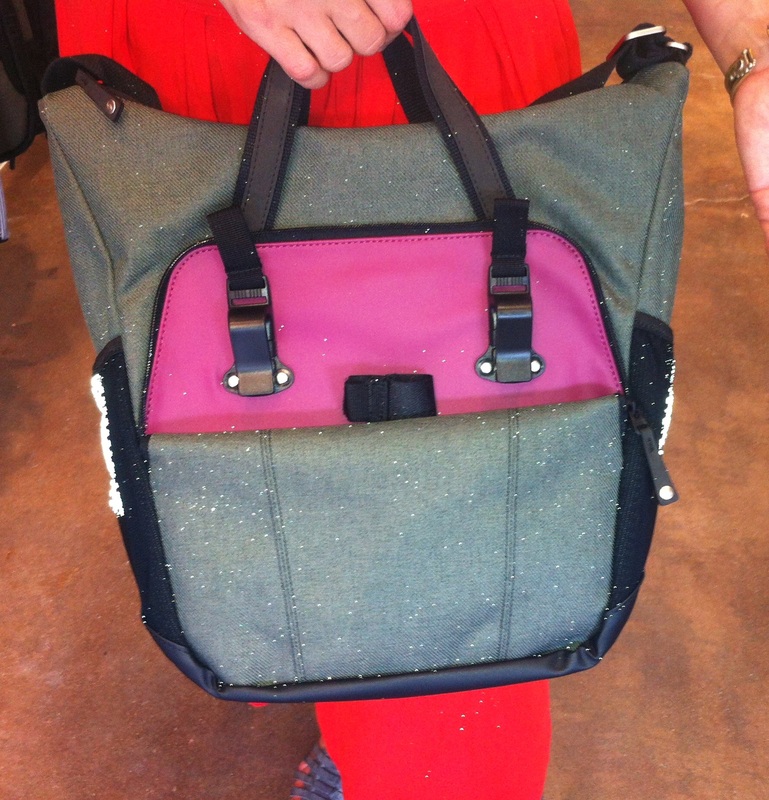 San Francisco messenger bag company, Timbuk2, opened its doors in Toronto last Wednesday and already it’s hopping. 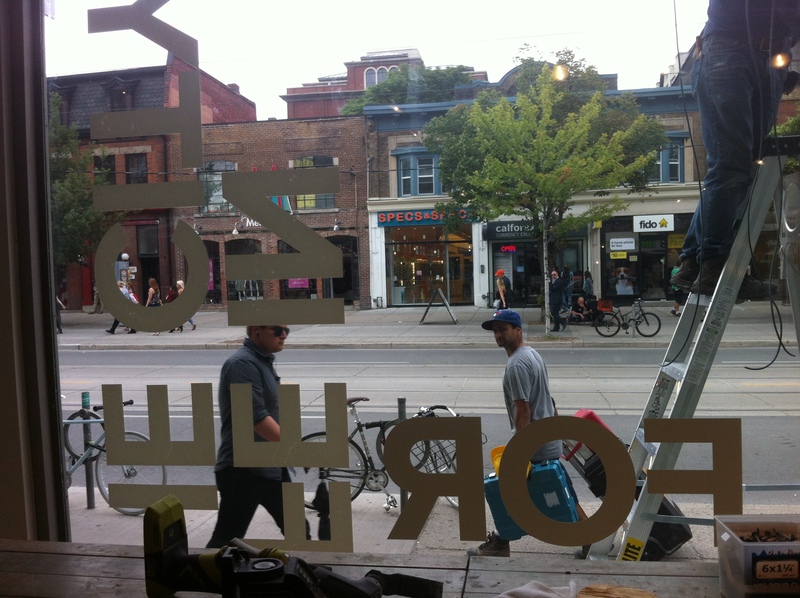 The steady influx of foot traffic on Queen West makes the intrepid shop an ideal stop for cyclists, urban commuters, tourists and shoppers of all interest and intent. “We have a friend who’s going back to Australia, and we’re looking for something that would remind him of Canada,” asked two ladies rushing in on a mission. Incidentally, Timbuk2 produced a limited edition Toronto Messenger Classic blag bearing the city’s flag. Mission accomplished. “Wow, I think they got the first one!” says Vanessa Christie, retail marketing lead at Timbuk2, who’s overseeing the launch. Whether or not you’re familiar with the Timbuk2 brand, you’ll know off the bat that it’s all about bags for urban life and lifestyles. Bags are a key accessory. And choice luggage is both useful and appealing. Otherwise, it’s just baggage. An island table at the front of the shop features the ‘Distill’ series: tastefully styled business casual bags for the fastidious professional. “We’re also expanding our line dedicated for women,” notes Christie as she demo’s the classy n clever handbag with hideable pannier hooks, thank you very much. Popular among cyclists is the Medio backpack with multiple features including ‘incognito’ reflective panels and expandable compartment for stashing a helmet. Oh and, for the fitness oriented urban professional, she or he would really dig the ‘Raid Pack’. This backpack is compact and whams you with cool features like a shirt board, hanger and shoe pouches: perfect for that pre-9 am workout. Of course, fans will definitely want to check out the classic messenger bag and its various iterations. Currently, the most popular picks are among the ‘Command’ series: a line that accommodates life on the go with laptop and tablet. I also noticed a few bags designed with cloth-like materials like wool and tweed. Apparently, the next generation of bags will have more of these. At the back of the store is a Custom Design studio where you can pick and choose from a wide selection of fabrics. mix and match on a touch screen and have an order placed and processed. In 3-7 business days, your custom bag will be ready for free shipping to the store or to your address for an $8 fee. As expected of a company rooted in the bike messenger ethos, Timbuk2’s product aesthetic is refreshingly pragmatic, understated and enduring. Indeed, the messenger bag continues to transform with the frenetic pace of urban living. “Our fabric and liner materials are thoroughly tested for durability and made of 100% recycled yarn from plastic bottles,” says Christie. I can attest to how these bags are built to last with my own classic bag from the late 90’s. Eco-conscious messaging is part what’s always remained true of Timbuk2 as the brand matures steadily from its humble beginnings in a garage where Rob Honeycutt hand-sewed bags to its present North American expansion (#timbuk2takeover). “We value community involvement. It just comes naturally when creating sustainable options for many types of urban lifestyles on the move,” reflects Christie.